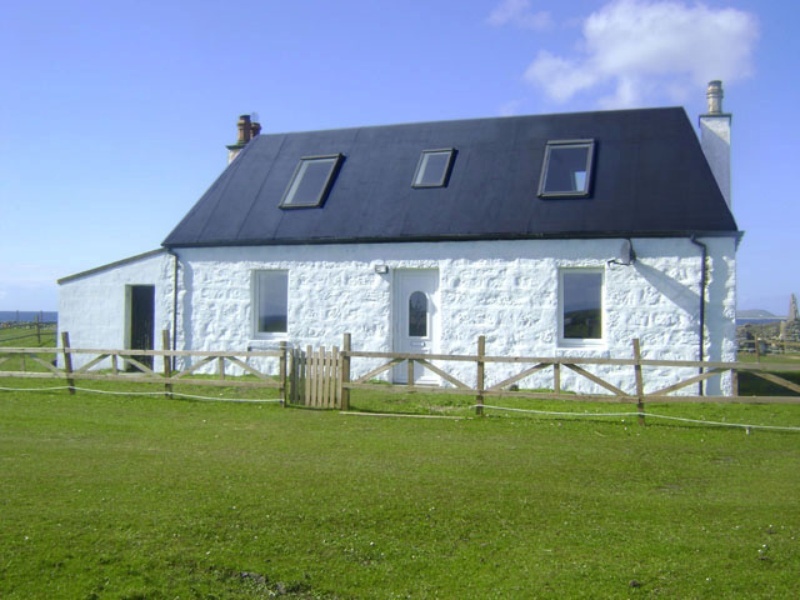 Fully renovated in 2012, Machair Cottage has a stunning location on the machair only 150 yards from the sheltered, white sandy beach at Heanish. Superb dual aspect, sea views from all 4 main rooms in the cottage with easterly views over towards the Isle of Mull and westerly views across Hynish Bay. This traditional Tiree Blackhouse not only sits just yards from the beach but is less than 10 minutes walk (or 2 minutes drive) to the main Co-op supermarket as well as the Scaranish Hotel bar and restaurant. Entrance Hall - coat hooks and shoe racks - leading off to the lounge, dining room and kitchen. 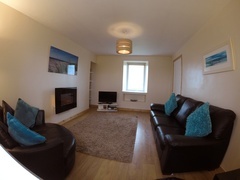 Lounge - has dual aspect sea views through large double glazed windows. A very comfortable room for watching TV and relaxing after a hard day walking, cycling, windsurfing or just sitting on the beach. There is a large 3 - 4 seater sofa (which converts into a kingsize bed with fullsize 5’ mattress) plus a large 1 - 2 seater corner snuggle sofa. 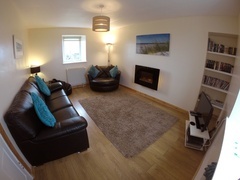 With a real effect electric wall fire, brand new 32” LED flat screen TV plus FreeSat satellite TV and DVD player plus a small selection of books and DVDs there is plenty to keep everyone entertained. Dining Room -includes a dining table and seating for 6 plus 2 additional lounger chairs – there is a selection of games available plus connection to the wireless broadband router. With sea views from both the front and back windows and an electric, real effect wall fire it’s a cosy room to enjoy dinner with a view. Kitchen - BRAND NEW KITCHEN INSTALLED IN 2014 - has new laminate flooring, a brand new fridge plus a brand new double oven installed and includes a washing machine, microwave and toaster and is very well stocked in terms of kitchen utensils etc all whilst looking out at the spectacular view across Hynish Bay. 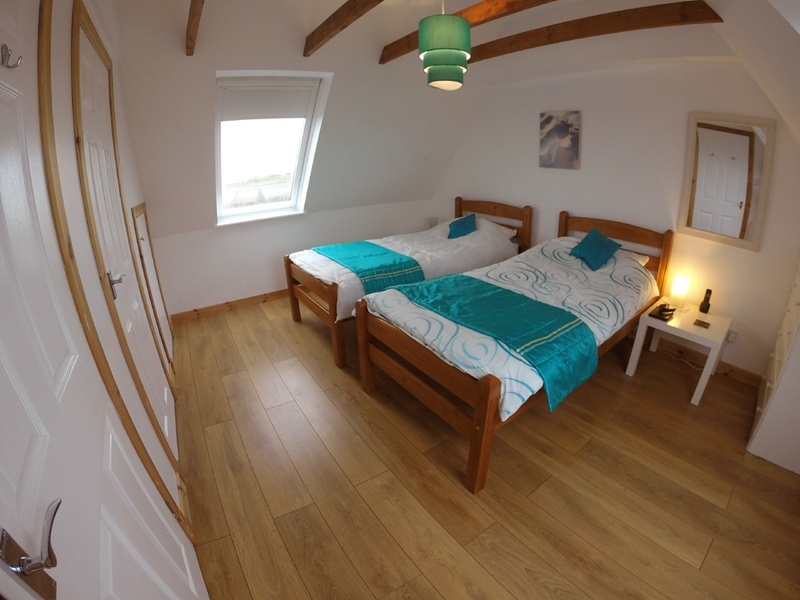 Main Twin Bedroom - has a built in wardrobe and fantastic dual aspect sea views through the large velux windows over towards Mull from the front and out over Hynish Bay from the back. Twin Bedroom - is fitted with the same large dual aspect velux windows and has a free standing wardrobe. Both bedrooms are wonderfully bright and airy but also benefit from being fitted throughout with total blackout velux blinds which will keep out the early morning sunlight. Bathroom - the brand new bathroom is fitted with a large shower and benefits from mains pressure hot water to provide an invigorating shower whilst again enjoying the uninterrupted view over Hynish Bay. 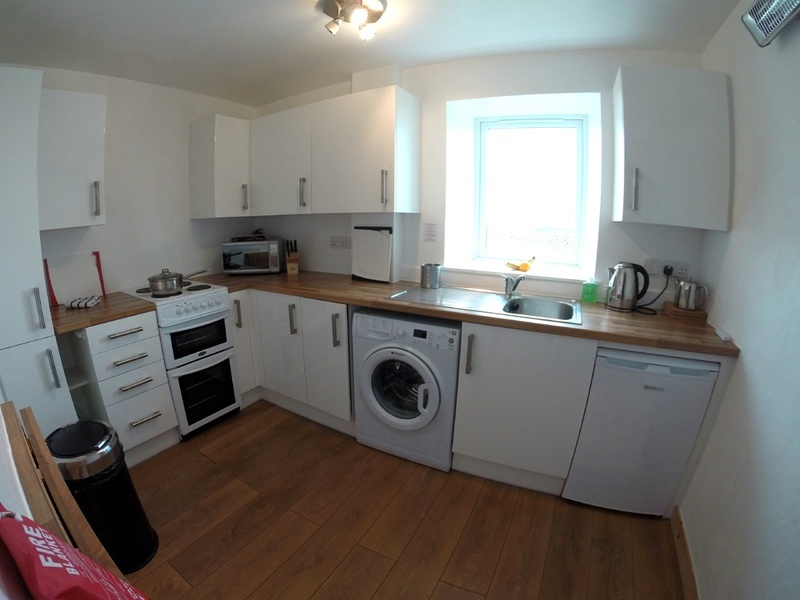 Rates include the use of electricity for heating (reasonable usage) hot water and cooking, all bed linen and kitchen tea-towels. Please bring your own bath towels, beach towels, high-chair, travel cot etc. Complimentary wireless broadband is included in the rental as is use of the beach chairs, body-boards plus a gas BBQ and a portable beach BBQ which can all be found in the lean-to. Outisde there is a large comfortable bench plus a large picnic table to allow you to sit outside, relax and take in the wonderful sea-views from the cottage. Car journey time from Ferry Pier to Machair Cottage – approximately 4 minutes. Car journey time from the Airport to Machair Cottage – approximately 10 minutes. The cottage is located about 200 yards from the road on the open machair – please stick to the tracks across the machair and park outside the front gate. Strictly no smoking and sorry, no pets or surf groups - please see our main website for Full T&C. E&OE. The following 2019 rental prices are per week based on lets running Saturday to Saturday. "We are all very impressed with the accommodation - it really is the nicest holiday property we have ever rented and Tiree is idyllic. Thanks so much." "We have stayed all over the islands all in all well over 30 times and your house was one of the best, we would definitely return and certainly recommend it to others without hesitation." We had a great week - very windy but cottage in a great location! Anyway, we’d like to come again next year too, let me know availability - can we have two weeks again please? Everything well presented throughout the cottage. Cottage clean and cosy with all mod cons necessary. Would recommend highly. The cottage is well equipped and well presented - Thanks for your assistance with the cottage and ensuring we had a lovely holiday. I thought I'd drop you a line to let you know what an amazing week we had in your beautiful cottage in Tiree. on which we have built so many fond memories of love, togetherness and friendships. I can't thank you enough for sharing your beautiful cottage with us. The position of the cottage was ideal- it seemed far from anywhere but just a few minutes from amenities. We loved our time on the island and very much look forward to returning. Loved the proximity to the sea. Cottage was comfortable and everything we needed. The lean-to was a helpful area to keep the bikes. Yes, met expectations and would definitely recommend it. We thoroughly enjoyed our visit to Tiree. We found Cornaigmore Beach on the first day and revisited nearly every day afterwards - it was so peaceful and we were happy there for hours at a time - splashing in the sea, digging and playing tennis on the beach. We were lucky enough to see some seals and also whales and sharks from the ferry! The food at the Beachcomber cafe was delicious and we had to try the lobster from Sam's van which was a real treat. Thank you for the stay in your nice cottage. The cottage was clean and has the necessary equipment. It was located in a beautiful area near the beach and I wouldn't hesitate to recommend it to others. Time on Tiree was spent touring island’s many beaches, walking, cycling and kayaking. We had another fantastic holiday on Tiree. As before the cottage was exactly what we needed - perfect location and facilities. Much to my disappointment, we'll not get the chance to head back next year, but will definitely keep your cottage in mind for future holidays. 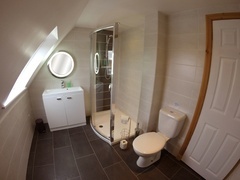 The cottage was ideal for our needs and was very much to our tastes - clean, bright and modern and very well equipped. We particularly enjoyed the upstairs rooms and the views. I guess ideally the lounge window would be lower but I imagine with the walls being so thick that’s a pretty laborious and expensive job!! You told me that you were extending eventually by changing the lean-to into a room, which would be great as either an additional lounge or an extra bedroom. Tiree is just amazing, totally relaxing - we've truly had a wonderful holiday and intend going again soon, with the intention of staying in your cottage. I'm already hoping to plan for another trip to Tiree next year! Thank you for providing such a super cottage. Had a great holiday weather was good most of the time - the week went so fast. 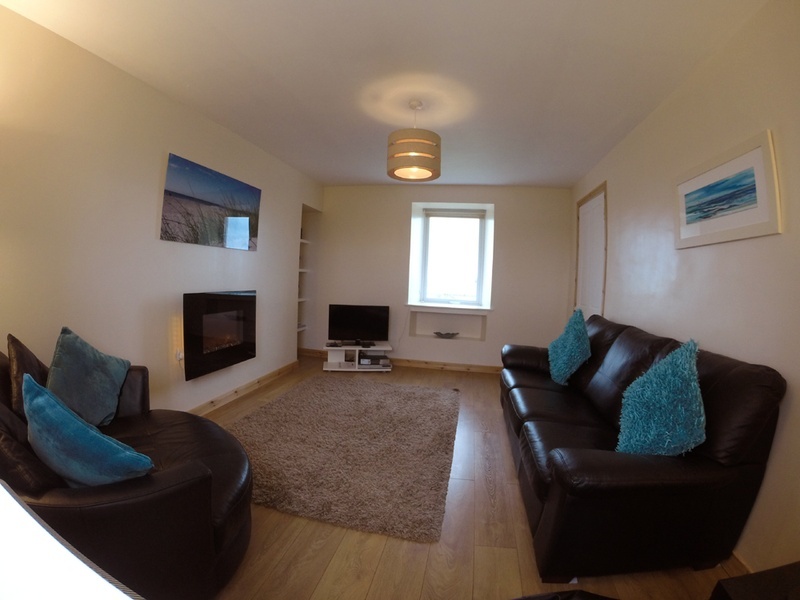 The cottage is in a great location near to the beach and shop and was what we expected.